While I adore video games, I'm equally fond of board and card games. On the Table is a weekly feature of my cBlog that examines some of these analog entertainments. If you have a suggestion for a game to appear in this column or suggestions on how to improve it, please let me know. In the last two weeks, On The Table has been all about Arkham Horror, a cooperative horror board game for 1-8 players. If you haven't read the column describing the base game yet, I highly recommend you check it out before reading this one. Continuing with our Lovecraftian theme for the month of May, I now bring you two further expansions for the game, Curse of the Dark Pharoah and The King in Yellow. Arkham is already a pretty dangerous place. From the monsters lurking in the dark corners of the sleepy burg to horrific rites performed by the secretive Silver Twilight Lodge, things are just bound to go wrong here. These expansions introduce new threats in the form of cultural events where man seeks to understand that which he was never intended to. One of the things that makes them interesting is they come with two suggested methods for their use: Permanent and Visiting. When the cultural event is a permanent one, it's just a part of everyday life in Arkham and all the new cards are simply shuffled into their respective decks. Should you choose to play with the Visiting rules, however, cards are typically placed on top of their decks, ensuring that you'll have to face new and unfamiliar challenges. Visiting rules are far more difficult for the players to win. Curse of the Dark Pharaoh concerns a museum exhibit recently opened at Miskatonic University which hails from far off and mysterious Egypt. Along with adding some new allies and spells, it introduces many powerful new relics and ancient threats. The first of the additions to the base game are Relic cards. These are treated just like unique items, except that they have no value and can only be acquired through encounters either in Arkham or in another world. Most of these can have considerable benefits for the investigators but come with consequences for their use. Another new wrinkle comes from Benefits and Detriments. These new cards are awarded to players as a result of specific encounters. They range from reducing the maximum movement of an investigator to giving them a second sight into what the Mythos might have in store for them (and even giving a chance to avert more dire fates). All of these cards also feature a condition that removes the benefit or detriment, allowing investigators to eliminate a disability should the chance arise while keeping positive effects always at risk of loss. Some events in Arkham can result in your investigator causing too much trouble for the powers that be. 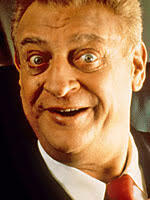 Should this happen, the character may find themselves barred from a neighborhood. While barred, the investigator may still pass through the streets of a neighborhood where they are no longer welcome but cannot enter any of the locations there. The last significant change are new Other World encounters. Included with an assortment of cards that work just like all Other World encounters but are specific to Curse of the Dark Pharaoh, come a few dual-colored cards. Unlike most of these events, there is only one named Other World. If the named world matches the one you are currently in, you must immediately have a battle with the Ancient One associated with that world. They're easier to defeat than should you be in the final battle but failure is just as devastating for your character. This is an interesting expansion, though not what I would call a significant one. All of the concepts added to the game could cause major changes to the way you play it but, in my experience, this rarely actually happens. If anything, I would consider taking the dual Other World cards and integrating them without bothering with the rest of the set, as they bring the most drama and excitement into the game. 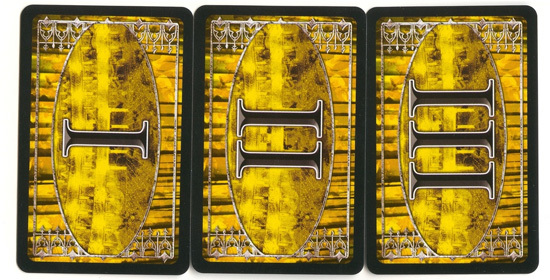 The second small expansion, The King In Yellow, refers to a play of the same name which is currently being performed in Arkham. Surrounded by rumor and myth, it is said that reading or viewing a performance has the effect of driving men mad. The set supplies still more equipment and spells for the investigators. Along with some of the new spells come Magical Effect cards. These are used to represent continuing effects from the use of these new spells. Having one does not count as an item, though they are used in the same manner as a weapon and often have conditions for their continued use. The greatest threat that the expansion offers comes from the play itself. Three Act cards are included along with six Mythos cards which govern when they enter play. Should you draw a Mythos card which reads "The Next Act Begins", you place the next Act card into play and must immediately make a decision. In order to prevent the play from continuing on its course, the investigators will have to make a sacrifice. If they choose not to (or cannot) give up what is required at this time, the Act stays in play forever. Should the third act begin, the entire city of Arkham descends into madness and the Investigators lose. Finally, The King in Yellow introduces a gameplay concept called "Heralds". These represent malevolent beings which seek to pave the way for the Ancient One to enter our world. Heralds add new rules and challenges to a game. When the set was released, Fantasy Flight Games made a second Herald available to fit with the Curse of the Black Pharoah expansion as well. The Herald which associated with this expansion is The King In Yellow, who adds challenges to the game as the terror level rises in Arkham. When the terror level is supposed to rise, the players must choose to place a yellow token either on the Doom Track (thus bringing the Ancient One closer to arriving) or on the Terror Track. When the latter happens, an important member of Arkham society is driven mad and introduces a global effect on the remainder of the game. 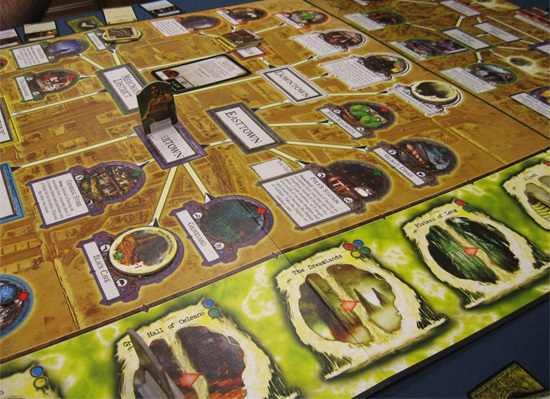 The King in Yellow is an excellent expansion for Arkham Horror, despite being relatively small. The Act cards are utterly terrifying in their high cost and damning effects, bringing a whole new level of intensity to the game. Heralds, too, crank up the deadliness of a round of play through extending the already powerful reach of an Ancient One. All of these expansions can be played individually or in concert, though attempting to play with all of them (Dunwich Horror included) is tantamount to suicide. More affordable than the larger expansion, they still bring a considerable amount of depth to Arkham Horror. If you were going to choose only one, The King in Yellow is the obvious choice and, frankly, should be a part of a Lovecraft gamer's collection.